The 1-6 scope market has quickly become the new standard for low powered optics. The ability to go from both eyes open on 1x to precision shots at 6x have really filled the gap between red dot users and scopes users. The 1-6 scopes have truly bridged the gap between choosing between a red dot and a scope. The ability to go from point blank range two eyes open to really dialing in that shot at 3-400 yards has been a game changer. So are all 1-6x scopes the same with just different price tags? Not quite. Just like many other types of scopes, 1-6 scopes can vary drastically depending on what features you consider important. Eye-box: One of the big differentiators at the different price points with 1-6 scopes can be the eye box. The ‘eye box’ is the general term most people use to describe how easy it is to get behind a scope. In other words, how much can you move your head around and still hold a good sight picture of your target. When at higher magnifications this isn’t as much of a big deal since you are typically dialed in trying to pull of a shot at distance. When at 1x however, this becomes critical as this typically means your target is at close range and your time to quickly acquire and engage can happen in a split second. True 1x optics: Its hard to explain how important this is for a 1-6 scope until you experience it for yourself. What makes a red dot so great and easy to use is the fact that it is a true 1x optical representation of what you are seeing with your unassisted eyes. This makes keeping both eyes open very easy which is critical for close quarters. If you have a 1-6 scope that is slightly magnified at 1x (i.e. 1.1x or 1.2x) it can be very distracting when trying to use the scope which can lead to closing one eye when aiming. This can plague even high end scopes from well known manufactures at any price point. All the scopes in this list have a true 1x or extremely close to it. Durability: You typically are not dialing 1-6 scopes so tracking performance is rarely an issue. What can be an issue on some lesser 1-6 optics is the magnification ring. Many 1-6 users slam from 1x to 6x rapidly. This is especially the case in 3 gun. Picking an optic that will hold up to rough use is critical. FFP or SPF: The general consensus is that SFP is the go to for 1-6x style optics. The reason for this is 1-6 users are typically going from 1x to 6x and rarely anything in-between. The other reason is most shooters want their reticle fully visible at 1x. If you are someone who is going to use your 1-6 scope at power ranges other than 1x and 6x FFP may be a good way to go. Daylight Bright: Most 1-6 optics are heavily reliant on their reticle illumination. Having a reticle that can light up bright enough to be visible during the day is critical. Since most of you are going to be mounting these on an ar15, check out my Best AR 15 Scope Mount article for mount ideas. 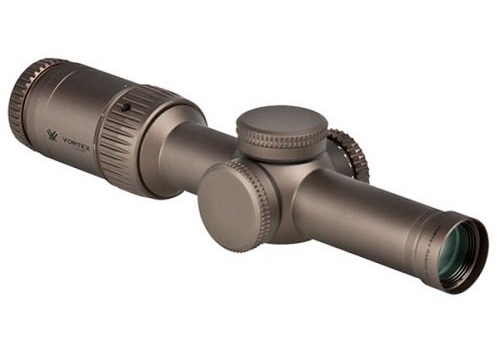 The Vortex Strike Eagle 1-6×24 was one of the first budget 1-6 scopes worth buying. When it was released about 2.5 years ago it seemed like they were on backorder right up until the end of last year, and for good reason. 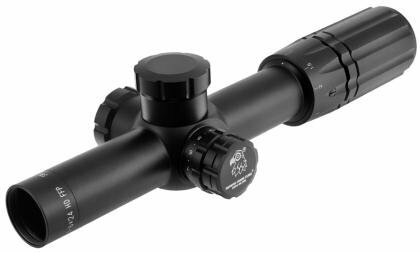 The Vortex Strike Eagle has a robust magnification wheel, easy illumination adjustments and one of the best eye box’s for the money. Glass quality is right on part with most scopes costing 1.5x more not to mention it carries the amazing lifetime no-fault Vortex warranty. With an easy to see SFP reticle and a price point under $400, the Vortex Strike Eagle may be the best overall 1-6 scope for hunters, target shooters and 3 gun shooters alike. Usually coming in under $300 the Primary Arms 1-6×24 is about as affordable as you can get for a decent 1-6 scope. What sets the Primary Arms apart from the Vortex is the fact that it has a BDC style reticle in it specifically set for the 223. I’m usually not a fan of caliber specific reticles but the ACSS reticle that Primary Arms has come up with is extremely nice. Where the Primary Arms 1-6 falls short of the Vortex Strike Eagle is mainly in the illumination department. While the illumination is super bright at 1x, you will notice that it does get slightly dimmer as you increase the magnification. The Strike Eagle on the other hand does not dim. Glass quality between the two is very similar with most giving a slight nod to the Vortex. 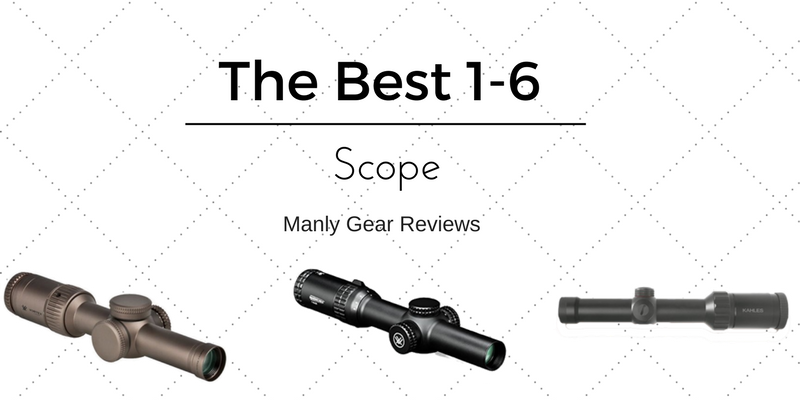 If you have a hard budget of under $300 you’d be hard pressed to get a better 1-6 scope. If you can stretch that budget a bit farther we think the Vortex may be a better choice. Either way you are going to be happy and have an optic that will last. 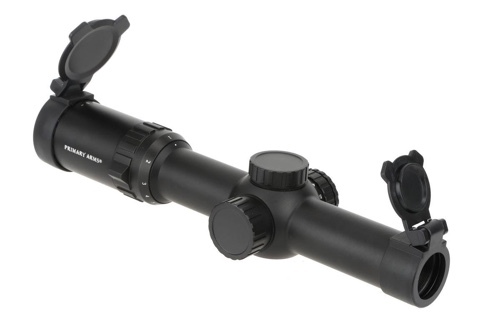 The SWFA 1-6×24 HD FFP scope was one of the first 1-6 scopes on the market. The first thing you’ll notice with this scope is it has an FFP reticle. As I said earlier most people shy away from FFP 1-6 scopes because the reticle is too small at 1x. SWFA combats this by having nice illuminated ring with a crosshair in the center at 1x. When you zoom in the illuminated ring disappears leaving a very nice illuminated crosshair for zoomed in precisions shooting. Another feature of the SWFA HD is the ability to run with the turret caps off. I admit this is probably something most people will not do but this scope does come with thread protectors so one can run cap-less for easier dialing for longer shots. Illumination is day light bright and consistent throughout the magnification range. The glass is truly phenomenal and very much an upgrade over less expensive scopes. The only knock against the SWFA HD 1-6 is the magnification ring. While built extremely tough, it can be difficult to turn in the cold. All things considered, the SWFA 1-6×24 HD FFP is by far the best 1-6 scope if you need an FFP reticle. The Vortex Razor Gen 2 1-6×24 is a personal favorite of mine as it’s the 1-6 scope that I have on my personal rifles. If you are not aware, the Razor line of optics is Vortex’s highest end of optics. They are typically made in Japan or the USA and are built to be the toughest scopes out there. The Razor 1-6 is no different. The first thing you’ll notice on the Razor 1-6 is how smooth the magnification ring is. it offers just the right amount of resistance for quick, sure-footed magnification changes. The locking illumination knob has very tactile knurls on it making it very easy to unlock and rotate. Glass quality is right up there with the SWFA HD. You certainly will not miss any shot due to glass quality. Where Vortex really hits it out of the park is with the JM-1 reticle and illumination though. Many top 3 gunners come to this scope for the simple yet effective JM-1 BDC style reticle with the illuminated dot in the center of the crosshairs. The reticle can easily be adapted to any caliber and the illumination dot is one of the brightest we’ve ever seen. 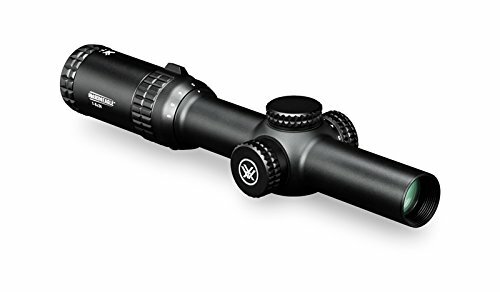 The Vortex Razor Gen 2 1-6 is one of the best 1-6 scopes for 3 gun and target shooters alike. Lets get this out of the way first. The Kahles 1-6×24 scope is expensive. Coming in around $2k it makes it one of the most expensive 1-6 scopes on the market. So is it worth it? If you have an extra $2k for a 1-6 scope the answer is 100% yes. I first looked through this scope at the 2015 Snipers Hide Cup. At the time my match rifle had a Vortex Razor 4.5-27×56 and my ar15 had the Razor 1-6 on it. Needless to say I was not lacking in optics. The optical quality of the Kalhles 1-6 is just in another league. Glass quality is hard to describe without looking through one but just know this scope will blow you away. The illumination is on par with the Razor 1-6 as well as the eye box. Durability is probably a step below the Razor, most everything is. Magnification ring is butter smooth. This is a pure luxury item. The SWFA HD and Razor 1-6 are both good enough to never hold anyone back. If you want the absolute best in glass quality though, look no further than the Kahles 1-6×24.